Nate Silver’s 538 website is considered by many to be the gold standard in political handicapping. It gets a lot right, although like most of the rest of the world, a day before the 2016 presidential election it had Hillary Clinton winning with a measure of comfort. Recently 538 published the current odds for all thirty-four U.S. Senate seats up for election as well as the 435 House seats. While they measure the chances of each candidate winning down to a tenth of a percentage point, they help us by categorizing each race in the following color-coded categories. I have to admit that I am somewhat mystified by their analysis of Missouri’s Second Congressional District. This is a region that includes most of suburban St. Louis County as well as parts of ex-urban St. Charles and Jefferson Counties. In 2008, Barack Obama came close to carrying MO-02, at a time when the district boundaries were more conservative than now. In 2012, Senator Claire McCaskill overwhelmingly defeated Republican Todd Akin in MO-02, his old district. In the August 2018 Missouri primaries, Republicans did not field serious candidates for either the St. Louis County Executive or the St. Louis County Prosecuting Attorney. The Democrats will slide to victory essentially unopposed this November. Cort VanOstran is a strong candidate for the Democrats, and while Ann Wagner is an entrenched candidate for the Republicans, she has many weaknesses including her phobias about meeting with voters or engaging in public forums or debates. Cort also has a very well-organized campaign with legions of volunteers. He has pushed the right buttons to raise significant amounts of money. He was very gracious with the four Democratic candidates who he defeated in the August primary and they have all pledged their support to him. So why is Cort seemingly trailing by so much, behind to a point where 538 gives Wagner a fourteen-to-one chance of winning? Seemingly there can be only two reasons: one is that 538 simply has it wrong; two being that VanOstran is not lighting the fire under Democratic voters to put himself in a more competitive position. Polling, to the extent that it exists for individual House races. Analysis of polls in similar districts, to the extent that they exist. Previous election returns in the district. How each candidate fared with primary opponents. Support by PACs and Super-PACs. Partisan lean; how the district voted in the two previous presidential elections. Congressional approval ratings; how incumbents in Congress are generally regarded. Examining micro-issues unique to the district. By these criteria, Ann Wagner has certain clear advantages; the district was carried by Mitt Romney in 2012 and Donald Trump in 2016. She has far more money than Cort, but he will be by far the best-financed Democrat in this election in the 2000s. Cort clearly has an advantage when it comes to the general perception of incumbents in Congress, although most voters give their own representative a pass on this criterion. It is difficult to define micro issues on the district that are different from national concerns. Without crunching the 538 numbers, it would seem that the race could be reasonably close. 538 works with algorithms, AKA an unambiguous specification of how to solve a class of problems. Algorithms can perform calculation, data processing and automated reasoning tasks. But there initially has to be human input, and we are not privy as to how 538 determines that. Clearly, the likes of Nate Silver are much smarter than I, but they too are prone to making mistakes. Perhaps the assumptions that they make into defining their algorithms simply are not a good match for Missouri’s Second District. Then again, despite a strong conventional campaign, perhaps Cort VanOstran is not lighting a fire under voters; one that the likes of 538 could see becomes part of a micro issue in the Second District. A year ago, there was another candidate in MO-02 named Kelli Dunaway who said that any Democrat had to find a way to get noticed and she was thinking about chaining herself to the fence at the toxic Westlake Landfill in St. Louis County. It has pizzazz, the kind that may be needed to get the mainstream media off dead-center and to raise voter awareness. Kelli later dropped out of the race, in part because she did not think that she had the financial resources to keep up with other Democratic candidates such as VanOstran. But her outside-the-box thinking should carry on. Wagner’s Achilles Heel is her hermit-like visibility on the campaign trail. Not only has she refused debates and forums; she will not appear any place where an opponent of hers might be. She carefully scripts her appearances to only be in front of “friendly audiences” and questions are essentially screened. For six years, the media has given her a pass on this. Her previous Democratic opponents have put pressure on her, but without the financial resources that Cort now has or a mainstream media seeing Wagner’s invisibility as a threat to democracy, most voters are unaware of Silent Ann’s strategy. Here’s an unsolicited suggestion to Cort. With the money that you have, get a jump on Ann through television ads, still a very effective means of messaging. I remember in 1996 when Bill Clinton was running for re-election and he saturated the airwaves with pre-emptive ads that essentially prevented Republican Bob Dole from ever getting his campaign in gear. Visual: Cort talking into the camera. “Hi, I’m Cort VanOstran, Democratic candidate for Missouri’s Second Congressional District. While I want to win this race, it’s far more important to me that the voters in the district are able to make an informed decision about for whom to cast their vote. For six years, Ann Wagner has refused to appear either in front of a neutral audience or with another candidate. I would like to have an open forum with Ann, the kind that the League of Women Voters sponsors. It is not my nature to attack or to be nasty. I just want voters to have an opportunity to hear both your and my ideas. Regardless of what you say, I will not be personal in attack, although I think that your positions on many issues require strong challenge. Voters, if you would like to encourage Ann to join me in an open forum, please text “Please, Ann” to xxxxx. I don’t know if this would tilt the 538 needle, but I think that it needs a stimulus. If Cort has a better idea, I’m all for it. I hate to go to a football analogy, but before Cort needs to throw a “Hail, Mary,” it would be better to construct a very effective two-minute offense. Time is running out. 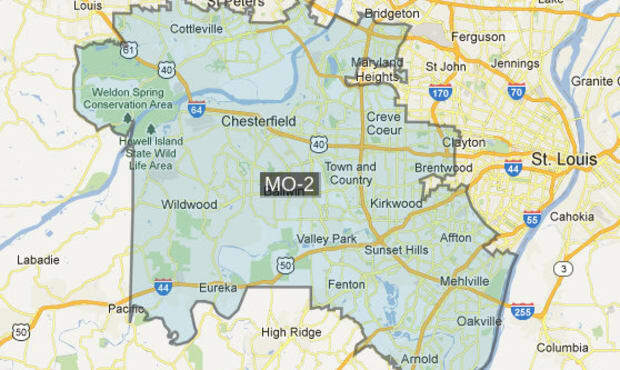 For a different take on MO-02, read Sarah Fenske’s article in Riverfront Times.